It’s a toss-up whether to showcase our simple but delicious lunch – soup, crammed with every veg. 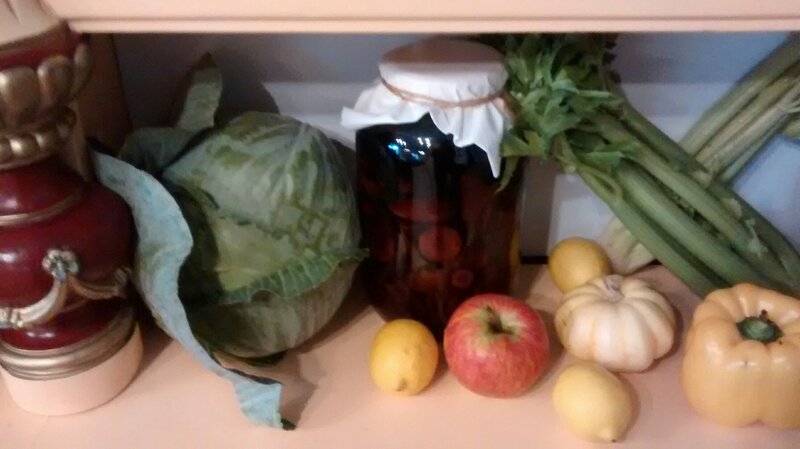 known to the allotment patch, eaten in the company of a pile of Polish students and workers, or whether to hark back once more to the war. All these vegetables were lined up in the café waiting to be transformed into soups and stews. For positively the last time, the war wins. My mother always acknowledged that she was lucky and lost nobody she cared about in WWII. She was a young teacher in York and evening fire-watching duties were rather fun. And all those handsome Polish airmen …. reader, she married one. Compare Krakow for the first four years and five months of the war. German troops marched through the city and occupied it. If your house was requisitioned by the army, so were its furniture and contents. You just had to leave. Familiar streets were renamed in German. Polish news sources of all kinds were banned. Secondary and University education was banned, and teachers who taught in secret risked the camps. Foods were in such short supply that Poles and Jews alike subsisted on under 300 calories a day for stretches of the war. Minor infringements, such as boarding a tram intended for Germans, or breaking the curfew resulted in a stretch in a labour camp. And if all that was tough, the Russians who succeeded the Nazis as occupiers were even worse. 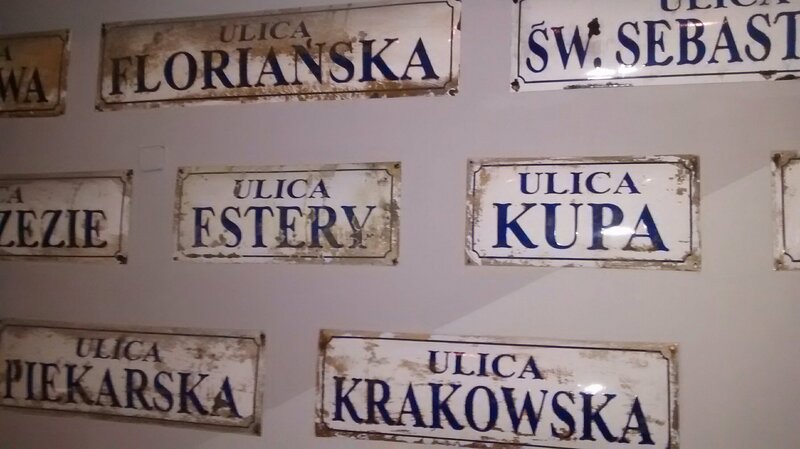 I know all this from our visit to Oskar Schindler’s Enamel Factory, now a museum of Krakow under Nazi Occupation. Polish street names ripped down, to be replaced by different, German names. I decided to bite the bullet, and tomorrow, I go to Auschwitz. Malcolm’s chosen not to go. I don’t blame him. Proud of you for your Auschwitz decision as I know I would be with Malcolm and not go. I’m quite anxious about it. But I’ve been confronted by so many difficult stories these last ten days that I feel I shouldn’t dodge this one. Margaret, I am trying to catch up with your trip to Poland, beginning with your most recent one. I have kind of been dreading the Auschwitz one, which I knew was bound to come. As for harking back to the War, it must be impossible not to be constantly reminded and referred back to it given the devastation and annihilation, the emotional scars, which I am sure are passed down in the DNA. I am sure there is nevertheless much to appreciate about modern day Poland and I hope you are coping with the emotion of it all. It’s been much tougher than I imagined. The Poles we’ve met have been charming, and in many cases too young to have participated in the struggles which animated their parents and grandparents. I’ve been a little surprised at how little a connection I feel with them. I don’t feel even a little bit Polish. I wish I did – my goodness they’re a resilient people. It’s not surprising really, you haven’t been brought up in that culture nor visited before. It will take some time to process everything and that won’t happen until you’re back home and have time to reflect. For now you are still experiencing and observing. It’s a lot to take in in one trip. I’ve now gotot to the point of wishing we weren’t going so soon! I hit “like” because I wanted you to know that your post was very much noticed by me. I wish we might learn from these horrors of the past to make a better present and a better future. I wish their was a heart button. Thank you. The depressing thing is, we don’t seem to learn or change, do we? It’s hard to know what to say, but I’ll be thinking of you. Actually you’ve been in my thoughts whenever I’ve seen the news about Ryanair after seeing people stranded in Poland on a news clip. us our onward journeys are by train. It’s all so sad, I feel so fortunate to have spent the war in relative peace unlike the poor Poles of all ages. Indeed. Sorry many disrupted lives. Your Polish posts have been really interesting and thought provoking. Our German daughter-in-law (raised and educated in the west) says they all had to visit concentration camps when they were at school. It’s left a lasting impression on her and has clearly helped to form her outlook on life and attitude attitude to peace and wider geopolitical issues. Glad the food is good, it seems you need something to lift the mood! I really have learnt a lot these last 10 days. Including how much Europe, Britain as well, needs to work together. Maybe in something like the EU? I think you’ll find your visit to Auschwitz really thought provoking, as we did, but I was glad we went. Malcolm has probably read enough about it to be able to imagine what it feels like. We all know what happened, and for me, being there didn’t make it seem any worse than I already knew it was. It certainly brings those atrocities back into focus. I agree. As far as facts went I didn’t learn so much. But as a way of making it real it was essential. I’m glad I went. It definitely needs to be there. Margaret, I feel my life runs parallel to yours, albeit I live in Australia. We share the same name, my mother’s from Yorkshire (trained at Ripon) and also taught during the war and fathers from Eastern Europe. My father was from the Ukrainian / Polish border but ended up in Dachau as a political prisoner. Mum also reminiscences about fire duty and the cooked breakfast with bacon they received as a reward. My mother came to Australia for 1 year exchange teaching in 1948 and met my father who was a refugee. What an astonishing comment to read. Thanks so much for getting in touch with tales of a family that has so much in common with my own. I wonder if you’ve had the chance to visit Poland? It’s made my father, who’s been dead for very many years, so much more ‘real’ somehow. It sounds as if you know England quite well though so I don’t know if you have lived there. Thanks so much for getting in touch. Who knows, we may meet one day? I have managed to meet one or two of the people I’ve got to know via blogging. This hasn’t been the usual carefree, frolicsome holiday, has it?! It must be giving you incredible insight, though, to the lives of your forbears, not to mention to the pain humans can inflict on each other. We’ve had a good time but it has been emotionally tough. I’ve learnt a lot and want to find out more. Interesting. Thank you. I’ll look those out. Oh, thanks for following! We’ve reached the stage of wanting to go home now. We feel assaulted by all we’ve experienced and just want a bit of peace and quiet to absorb it all.